Big Spoilers for this week's issue of X-Men: Gold, so just a warning for the sensitive! They've been the on again/off again mutant couple du jour for nearly forty years, but now it looks like they are finally ready to settle down. 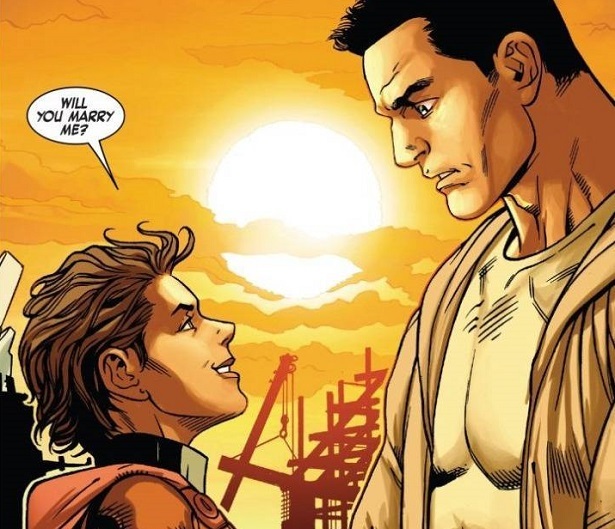 According to Comic Book, in this week's issue of X-Men: Gold, team leader Kitty Pryde proposed to to her longtime boo, fellow X-Man Colossus, a.k.a. Peter Rasputin. The proposal happened after a several-issue arc which found the team in the Negative Zone. After the pair survived another near-death situation together, Kitty proposed to Peter as soon as they got home to the Xavier Institute. You can check out the panel where the former Shadowcat pops the question below. To be fair, we haven't seen Peter's answer yet, but Marvel Comics have been promising a big wedding lately, and this could fit the bill. If in fact Kitty and Peter do find wedded bliss, it will have been a long and bumpy road for the couple. When Kitty was first introduced to the team, she was all of 14 years old, and had a huge crush on Colossus from the moment she set foot in Xavier's School. Eventually, her puppy love turned into something more serious, and two youngest members of the team began dating. But when Peter fell in love with someone else during the events of Secret Wars, Kitty's heart was broken and she moved on. When Kitty became leader of the X-Men Gold Squad, she adamantly told Colossus that their romantic relationship was long over, and it was time for him to move on. But as the months rolled on, it showed that her hard stance against Colossus was really a smoke screen to cover her own feelings, which never went away. Here's hoping these two make it to the altar -- and that their marriage is a happier one than Cyclops and Jean Grey's! What do you think about Kitty and Peter finally tying the knot? Be sure to let us know down below in the comments! More of the nerdiest news! Legends of Tomorrow teases a new queer couple! Black Lightning has a lot more on its mind than typical superhero shows! Odds on who will survive the final season of Star Wars Rebels!